Objects in motion! Marble runs are not only entertaining, they are educational. HABA marble runs are an excellent study in Kinematics. Watch the progression. HABA's interchangeable blocks allow creativity in track design. Connect long ramps to rolling hills and looping tracks. HABA even offers musical elements. 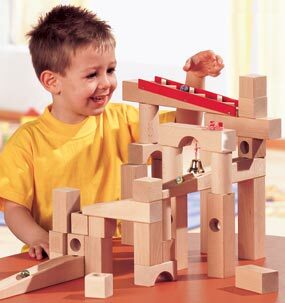 Plan Toys marble runs are colorful and basic. Their marbles are larger and Plan Toys uses rubber wood for their marbles and tracks.